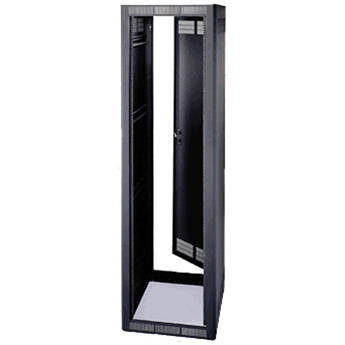 House your equipment with the Middle Atlantic WRK-SA 24 Space Gangable Enclosure Rack with Rear Door. This rack securely and attractively holds your expensive equipment with fully welded construction and 16-gauge solid steel. A cable management system lets you keep your workplace sleek and organized while a fully adjustable pair of front rackrails gives you the versatility your projects demand. And the SA kit includes Solid 1/8" thick, extra-wide face, 10-32 threaded rail which accommodates lacing, while generously large openings are provided for passing cable through. The SA Kit includes Solid 1/8" thick, extra-wide face, 10-32 threaded rail accommodates lacing, with generously large openings for passing cable through. Fully welded construction provides 2500 lb weight capacity and when used in conjunction with the WRK-Z4 brackets the ERK is even seismic certified for up to 1000 lbs of essential equipment. Protect your equipment cables with Middle Atlantic's open bay concept, perfect for accommodating large cable bundles. In fact the rackrail features cable pass-through openings in the face. This stand-alone enclosure has a pair of fully adjustable front rackrails. The bottom features a pre-installed grounding and bonding stud for your convenience. The keylocked solid rear door is standard to protect your equipment at all times. Box Dimensions (LxWxH) 55.0 x 36.0 x 26.0"